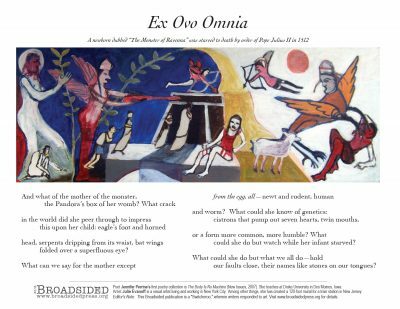 Note: “Ex Ovo Omnia” is a Switcheroo, an annual feature in which we invite writers to respond to art we post. What surprises you about Jennifer’s poem in conversation with your art? Artist Julie Evanoff: Honestly, I’m surprised that she was able to pull out what seems like such a specific narrative that goes deep into the myths and stories that inform our collective and individual unconscious in a way that resonates with my sense of the painting. What leapt out first from Julie’s art? A particular image? A mood? A line? Poet Jennifer Perrine: At first, I saw red. I was drawn in by that color, especially by the red-bodied figure on the right, and it wasn’t until days later that I realized it had reminded me of the character I’d imagined when I read Anne Carson’s Autobiography of Red (which I love! ).